High end signs at low prices! Engraved signs make very attractive office signs. 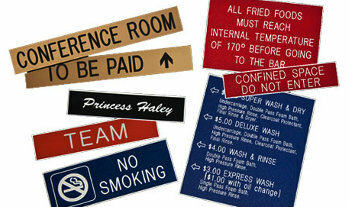 Their easy to recognize images along with contrasting letters make them ideal for any workplace. Engraved signs are also strong enough to last outdoors and are available in hundreds of colors and finishes. Our sign builders will also come to your business and install the signs for you. Check out the samples below and contact us at 530-544-7058 for your custom quote.